Break Brittle is a collection of premium crispy, crunchy cashew brittles that are vegan, gluten-free, and crafted without butter, oil or any added fats while still being as delciously rich as any other brittle! Created and produced in the San Francisco Bay area, these tasty confections are crunchy, sweet, slightly salty, and all-out delicious, with the perfect balance of chocolate to brittle in every bite. Available in Chocolate Sea Salt and Chocolate Espresso. 4 oz. (113g) packages are $7.99 each. *NOTE* - Chocolate can melt in the summer heat, especially if your destination area temperature is in the mid 80s or above when the package takes more than a day or two in transit. We recommend expedited 2nd Day Air shipping and with the addition of a cold shipper (offered below) for orders where you want to minimize the risk of melted chocolate, and that it is delivered where someone will be there to accept the package at time of delivery (work address if not at home). The link to select a cold shipper is shown below, please click that link to be able to add the appropriate cold shipping supplies if you wish to protect your items during the hotter months. We cannot accept responsibility for melted chocolates, so please order at your own risk! From Anonymous of Houston, Texas on 3/19/2019 . 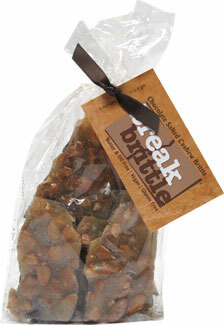 This is truly the most delicious brittle I have ever tasted! I am vegan and have not eaten brittle in many years. So happy to have this vegan option now! From Janelle Davidson of Ashland, Oregon on 6/27/2018 . Very delicious. I would definitely buy this again, both for myself and as a gift for others.